The holidays hit PlayStation Home this week, bringing new content for MotorStorm: Pacific Rift, a Dead Space 2 costume, free copies of Diner Dash, and a mysterious Festive Tree in the Central Plaza. Yes, it's not a Christmas tree. It's a festive tree, because everyone has different festive celebrations at the end of the yeah, and singling out one is wrong. *eyes his headline* Oh well. 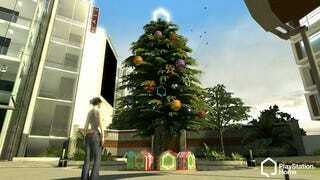 Either way, there's a decorated tree, and PlayStation Home online community specialist Locust_Star urges home-goers to work together to solve its riddles over the course of the month in order to reveal some surprising developments. This week also brings a beachfront personal space with a MotorStorm: Pacific Rift theme, and a miner costume in the store to celebrate the recent announcement of Dead Space 2. Hudson brings the insanely popular casual game Diner Dash to the PlayStation Network this week, and there's a scavenger hunt taking place in Home on Friday, December 11th, in which players can piece together codes for free downloads of the game. Check out the link below for more details on this week's PlayStation Home festivities, and have a happy and safe generic holiday.